COLLECTING MUSHROOM REQUIRES 100% CERTAINTY. WWW.FORAGINGTEXAS.COM ACCEPTS NO RESPONSIBILITY FOR IDENTIFICATION ERRORS BY ANY READERS. Giant Puffball in woodland clearing. 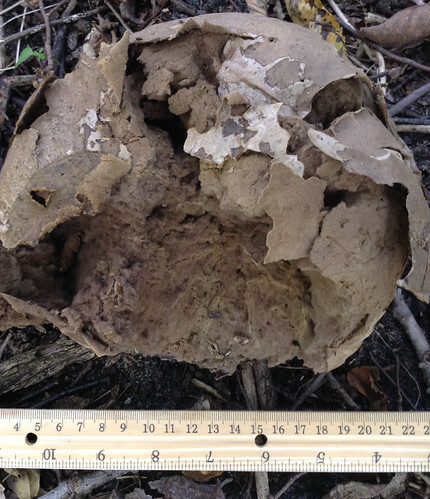 Underside of Giant Puffball. They have no gills, pores, or stem. Cutting the above mushroom in half top to bottom, the yellowish interior reveals it's past time to eat it. 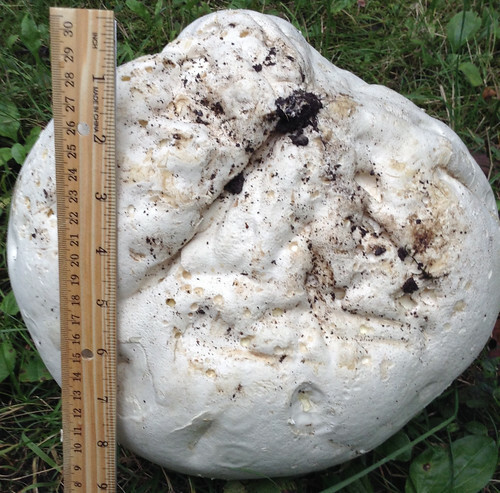 Another Giant Puffball. This one is lumpy and misshapen but still really big! 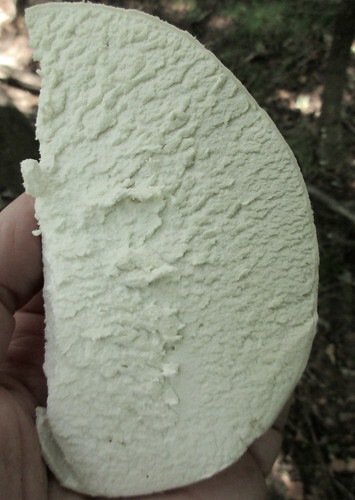 Cutting it open reveals the entire interior is a uniform, creamy white color so it's still good to eat! This is what it should look like inside if you're going to eat it. 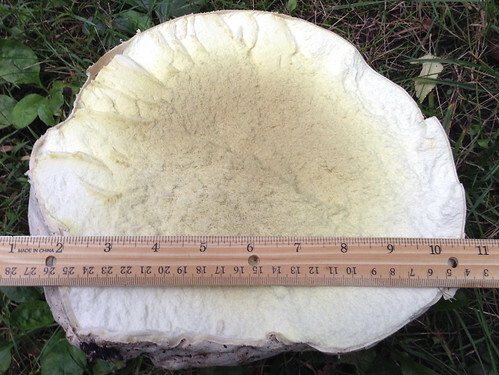 An old Giant Puffball, already going to spore stage. Tearing open the old Giant Puffball. It released a big cloud of spores. 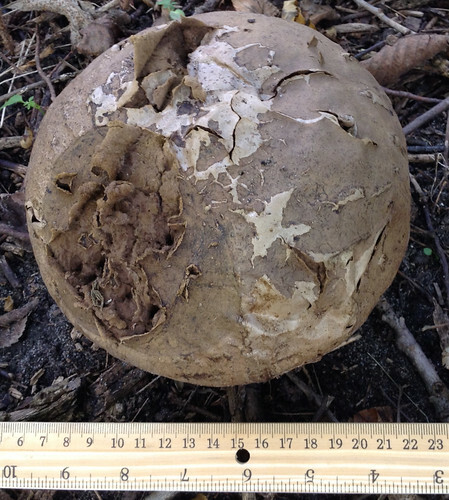 Walking across a field or woods you spot what looks like a somewhat deflated soccer ball...or a bleached human skull laying in the grass and leaf litter. Touching it reveals a rubbery surface over a spongy interior. 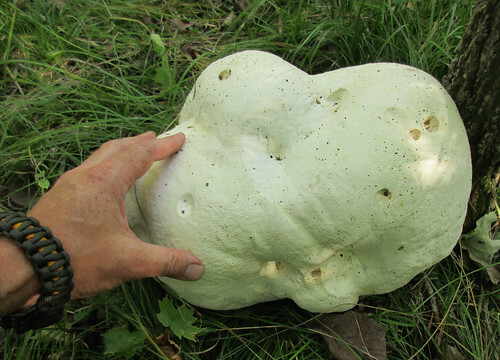 You've just found a Giant Puffball! These are pretty rare in Texas, being only found in a few counties in central Texas. They prefer cool weather so look in winter and early spring. 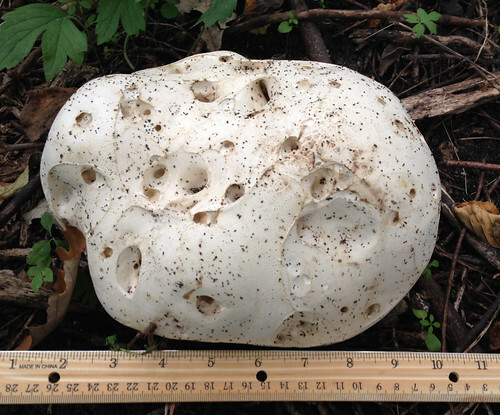 Texas has plenty of smaller puffballs such as Vascellum curtisii, Scleroderma texense, Gymnopilus spectabilis, Lycoperdon pyriforme, and others but none of these get much bigger than a lime and most are smaller than that. 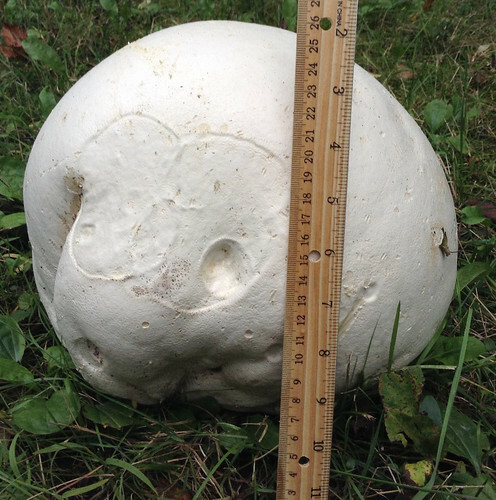 Giant Puffball (Calvatia gigantea) is in a humongous size class all its own. A. It's creamy white all the way through. No sign of yellow or brown which indicate it's already making spores which will make you ill.
B. 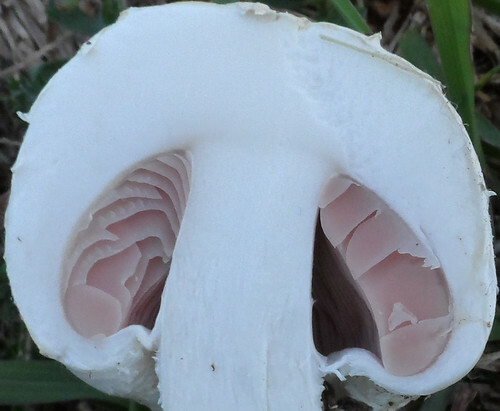 There are no immature gills or an outline of a traditional mushroom hidden in the mushroom. 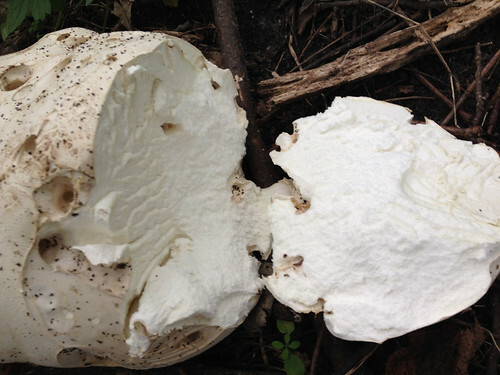 Seeing either indicates you do NOT have an edible puffball but rather a young, deadly Amanita or other dangerous mushroom that looks like a puffball but matures into a normal "toadstool" shape. This looked like a puffball but cutting it in half revealed immature gills as described above in B. This is NOT an edible mushroom!! When cooking Giant Puffballs think of them as a chunk of tofu-like matter. The favored way of preparing them is cut them into 1/2" thick slices, batter them with milk, salt, & flour, then fry them in hot oil until golden brown. You can also thinly-slice them followed by sautéing them in butter and some garlic. Good Lord, y'all have no idea how hungry I get when working on this blog! Buy my book! Idiots Guide Foraging covers 70 of North America's tastiest and easy to find wild edibles shown with the same big pictures as here on the Foraging Texas website. I use third-party advertising companies to serve ads when you visit this website. These companies may use information (not including your name, address, email address, or telephone number) about your visits to this and other websites in order to provide advertisements about goods and services of interest to you. If you would like more information about this practice and to know your choices about not having this information used by these companies, click here. Lucky Peach Magazine Article "Foraging with Dummies"
Bountiful Gardens - they are the best sellers of "wild" plant seeds. Plants For A Future - what plants are edible/medicinal/toxic. Eat the Weeds- Green Deane's guide to edible plants. EthonoHerbalist - Science facts behind traditional herbs. The information provided using this web site is only intended to be a general summary of information to the public. Every effort has been made to ensure the accuracy and completeness of the information on this Web site. However, I make no warranties, expressed or implied, regarding errors or omissions and assume no legal liability or responsibility for any injuries resulting from the use of information contained within. Copyright 2006 by Mark "Merriwether" Vorderbruggen. Simple theme. Theme images by konradlew. Powered by Blogger.